Physical Address: 230 Pension Rd. Mailing Address: 230 Pension Rd. Englishtown, NJ - The historic track informed its employees on Tuesday night, January 16th that the track will not have racing in 2018. 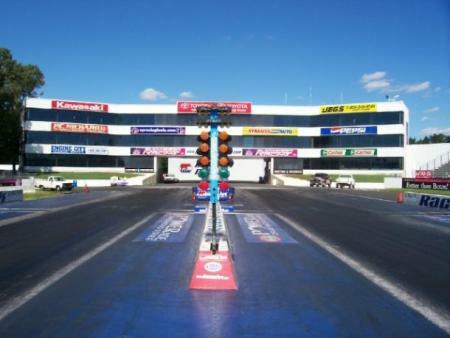 Raceway Park was one of the NHRA’s original seven national events. Old Bridge, NJ - The other drivers visiting the winner’s circle were Joseph Santangelo in Super Stock; Philip Smida in Super Comp; Karri Khoury in Super Street; Jason Kenny in Super Gas; Ed Armstrong in Pro Stock Snowmobile. Englishtown, NJ - Peter Biondo and Frank Aragona powered their way through competition to victory Sunday at the 48th annual NHRA Summernationals at Old Bridge Township Raceway Park. Englishtown, NJ - It was a fifth win of his career, in six final round appearances for Justin Picillo of Warwick, R. I., all in Stock Eliminator. Picillo worked his way through the field and ran 10.593 seconds at 123.06 mph in his final round victory over veteran racer Peter Biondo, Maspeth, N.Y., who clocked in at 10.362 seconds, 120.60 mph. Englishtown, NJ - Rounding out the winners were Daniel Bisbano over Frank Aragona in Super Comp; Ed Alessi won a close one in Super Gas against Tom Stalba; Eugene Schneck won his first in Super Street. Englishtown, NJ - Arnie Martel lead the list of Lucas Oil Drag Racing Series winners this weekend at historic Old Bridge Township Raceway Park and the 46th annual Toyota NHRA Summernationals. Englishtown, NJ - In the final results from the NHRA Lucas Oil Drag Racing Series national event, Scotty Richardson, Barbourville, Ky., took home his 38th career win and Val DiGenova, Derry, N.H., received his first Top Dragster win at the 45th Annual Toyota NHRA Summernationals. Englishtown, NJ - In Comp Eliminator it was Kyle Cultrera, Eliot, Maine, taking his second win of the year in his ’32 roadster in 9.012 seconds over the quicker Chip Ippolito. Cultrera also won back in June at Lebanon Valley Dragway.